The Oral Surgery Model Series offer models that allow basic incision/suture techniques and infiltration anesthesia practice, as well as models that allow various oral surgery treatments such as tooth extraction and pus removal (incision). -	Battery-powered audio signal and light signal indicates when correct position and angle injection is achieved. Audio signal can be turned off for testing and evaluation purposes. 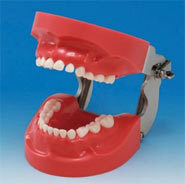 By combining together the typodont tooth model, wax form and third party typodont articulators, you can do various typodont practice. Pedo jaw model representing a 6-year old dentition, Soft gingiva type model, Mixed dentition with primary teeth and permanent teeth (permanent teeth are #16, #26, #36, #46), Suited for abutment and cavity preparation. Pedo jaw model representing a 6-year old dentition, Hard gingiva type model, Mixed dentition with primary teeth and permanent teeth, Suited for abutment and cavity preparation.